Dare we say it? Fifa is a corrupt institution and it goes all the way to the top? Can things be changed? Answer is no. Not at the pace we have decided upon. At least not as the world's governing soccer body is concerned. Blatter was reelected and it's the equivalent George W Bush of four more years of "how the heck?" for a majority of the population. For Blatter that comes up to about 1 billion people, at least. But Mr Sepp heard the people. Enough noise was made by everyone inside and outside of Fifa that he had no choice but to resign if he wished to live in some sort of dignity and to leave the organization at a time of transition. A planned escape perhaps? And while his exit is a welcome sight for pretty much everyone, the inevitable questions about corruption remain. How deep up the line did the corruption go? 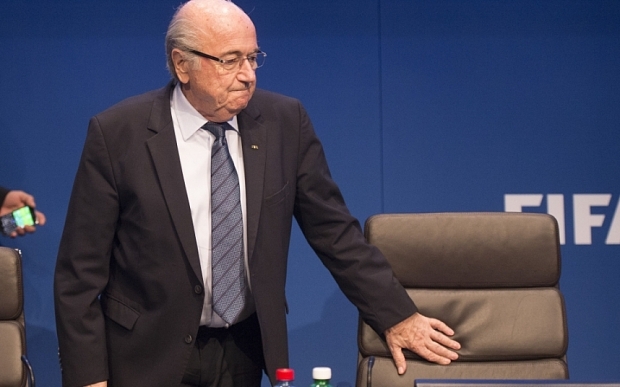 Was Blatter involved in transactions carried out by other individuals? Did he personally engage in this behavior? The real test comes down to Fifa and its minions. Serious changes in culture are needed beyond incarcerating "top officials," even though this is a step further from anything the American government ever did about the culprits behind the financial crisis. Those were powerful, big banks. Here, we're talking about officials from various countries with enormous power on world football decisions, not to mention monetary assets. How did Russia and Qatar fulfill their World Cup bids? It's interesting how Russian authorities (including Putin) have labeled US involvement in the corruption charges as an overreach. And many of the overall corruption charges go towards granting Qatar's successful bid for 2022. Let's remember that the Persian Gulf nation has never participated in the tournament. And now charges have reached all the way to Ecuador with television rights for the Copa America in the next 3 tournaments, including Chile 2015, under question. Luis Chiriboga, president of Ecuador's soccer association, has been accused of millions of dollars in embezzlement. Even his son has been connected to suspicious activities worth millions of dollars. How far does this rabbit hole go? Should we replace everyone in command just so the next generation of questionable individuals take charge? One can only hope this won't be the case and we can get back to enjoying the beautiful game on the pitch. For now, kudos to Loretta Lynch for her actions in exposing the top officials that have damaged world football.